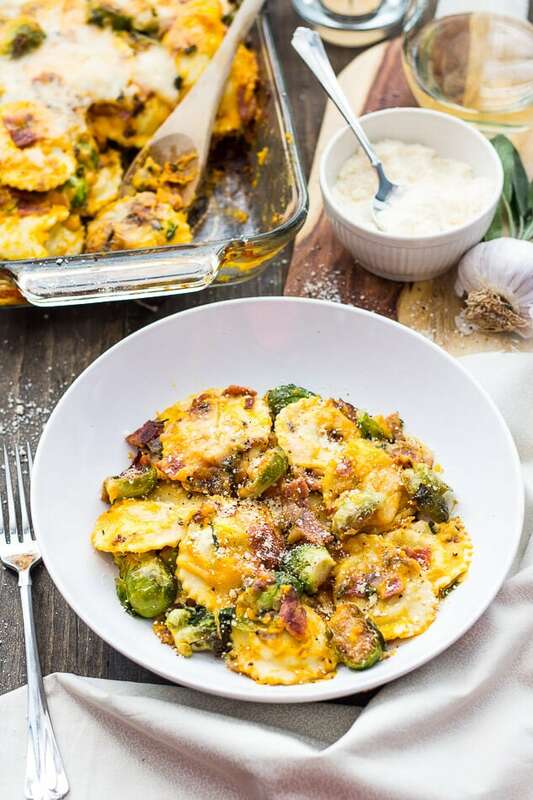 Filled with brussels sprouts, shallots and bacon, this Butternut Squash Ravioli Bake is an indulgent yet incredibly easy fall recipe perfect for those cozy nights on the couch. You forever have my heart through all the dark evenings of late fall. I kind of have a love-hate relationship with November. I love the fall behind time schedule (yes, I slept one extra glorious hour this weekend! ), but I also can't stand the fact that it's dark out at 5pm every night. I mean, it's kinda depressing. It's hard to run errands after work because it's so damn dark out, and I sometimes find my energy levels are depleted at times in the day when I usually have the most pent up energy. But it's also a good excuse to stay inside, dive into ten thousand blankets and just hibernate all evening on the couch with a good movie or your fave show on Netflix. I seriously love this time of year for that. No more feeling guilty about staying inside on a sunny day. And yet if you want you can still head on outside because there's no snow or cold mess waiting for you outside like in January and February. 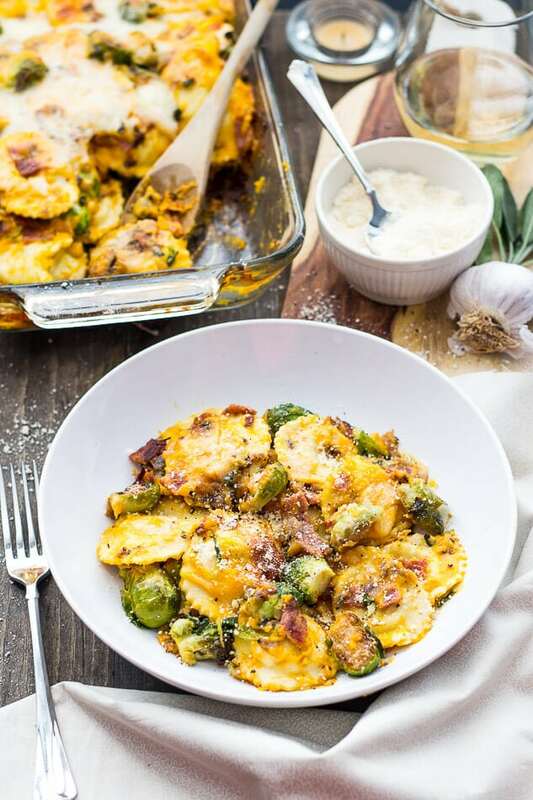 Well, if you're looking for an astounding spend-your-evening-on-the-couch meal, this Butternut Squash Ravioli Bake has got your back! Have I mentioned my obsession with it? Okay, maybe I have more than a few times. But it is SO TOTALLY WORTH MAKING. And you can totally make it in advance. I usually buy a whole butternut squash and either roast it in the oven with some garlic and onions, or boil it til softened then puree it into the most velvety, creamy mixture, and then I freeze it for future meals. One large squash usually makes 3-4 good-sized containers of puree to be used in future pasta sauces, soups, ravioli fillings, etc. You could make your own ravioli of course, but I usually cheat and buy the frozen kind. However, I did splurge on this fresh ravioli one time with buffalo mozzarella and basil filling – it was nearly double the price of the frozen stuff but SO SO good. So you can always fancify this ravioli bake even more. I was actually a bit nervous to mess with a classic. My mom already makes this delicious ravioli bake using frozen spinach and cheese ravioli, then piles on a rich, meaty tomato sauce and shredded mozzarella cheese before baking it in the oven. It's super good, but I thought this dish could use a twist. And boy was I right!!! The butternut squash sauces works perfectly here, and you can use any variety of seasonal veg that you want. I know some people have an aversion to brussels sprouts, so you can definitely switch it up and throw in some broccoli or kale or any other kind of green veggie you prefer. Heck, you could probably even get away with adding more root vegetables. The sauce is kinda like a vegetable in and of itself, and that must count for something right? So, I say bring it on November! Bring on the cold and the dreary grey days and ever-lasting dark nights. I shall fight back with wine, ravioli bake and Netflix. Maybe I'll even put my PJs on at 8pm while I gobble this down. 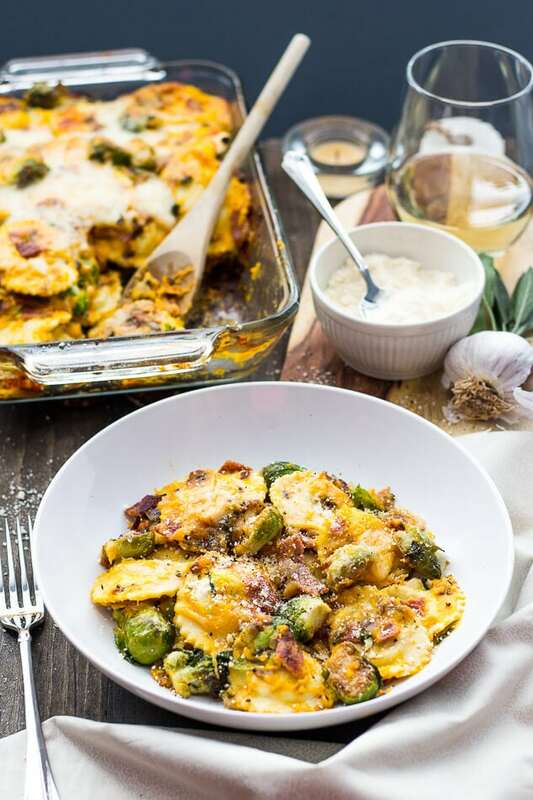 Now go make this Butternut Squash Ravioli Bake. Or at least get started on the sauce. You're gonna die over this! And if you try any of my recipes be sure to let me know on Instagram, Twitter, Facebook or in the comments – I'd love to see what you come up with and talk all things fall comfort food! Peel butternut squash and chop into 1 inch pieces. Bring cubes to a boil in a large pot of water, cooking for 10-15 min until tender. Drain and let cool, then puree. You can do this step ahead of time, cooking a whole squash and freezing the puree for two servings of sauce. In a large frying pan, heat 1 tbsp olive oil over med-high heat. Add turkey bacon and cook for 2-3 min each side. Remove from heat and once cool, chop into small pieces. Add remaining tbsp of olive oil to the same frying pan, then add brussels sprouts, garlic, shallots and sage sauteeing for 4-5 min on med-high heat until veggies are tender-crisp. In a medium-sized saucepan, add butternut squash puree, milk and cream. Bring to a boil at med-high heat, then lower heat to med-low. Add parmesan cheese, salt and pepper, stirring to combine well. Add ravioli to a greased 9x13 oven safe dish. Add bacon and brussels mixture. 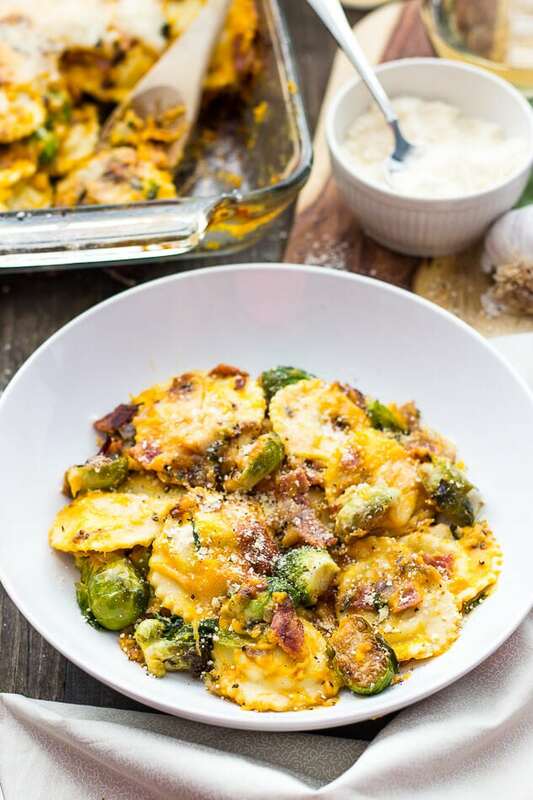 Cover everything with butternut squash sauce, then top with parmesan and mozzarella cheese. Bake for 30 min, then serve immediately. You'll now know the culprit behind my next couch coma. This looks amazing! 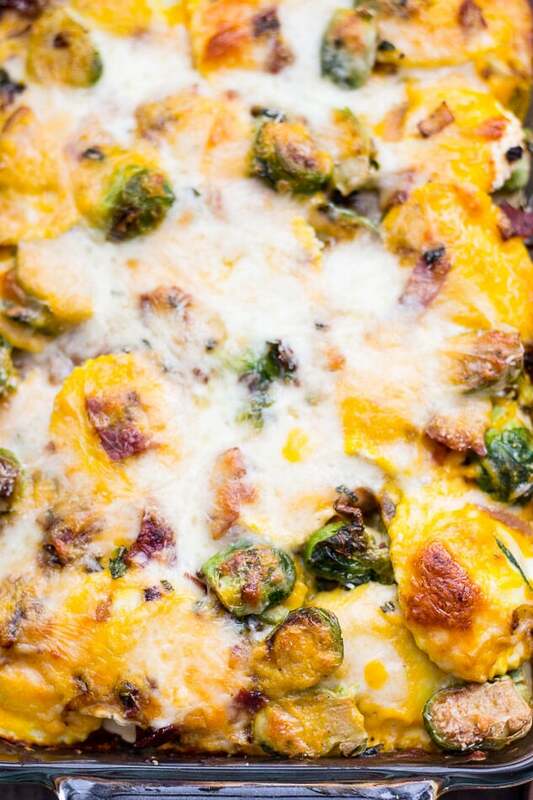 I love that you added the bacon and brussels sprouts straight into the bake. Yum!! Thanks Kim! Definitely makes for an easier dinner! Are you supposed to cook the ravioli first ? This looks so delicious! I can’t wait to make it! LOVING all these flavors! 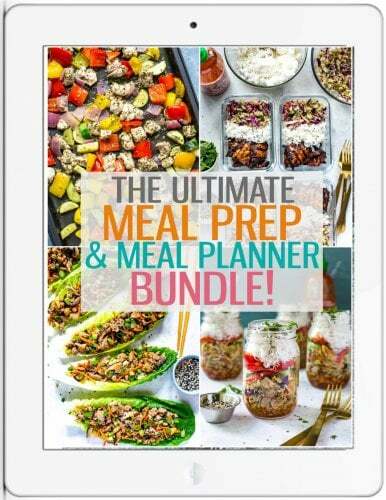 Going to try to make this dairy free with coconut milk and vegan cheese! And like you I loved the extra hour of sleep but hate how it’s now going to be dark at 5! So depressing indeed! Hey Vicky – LOVE that idea, please let me know how it turns out if you do. 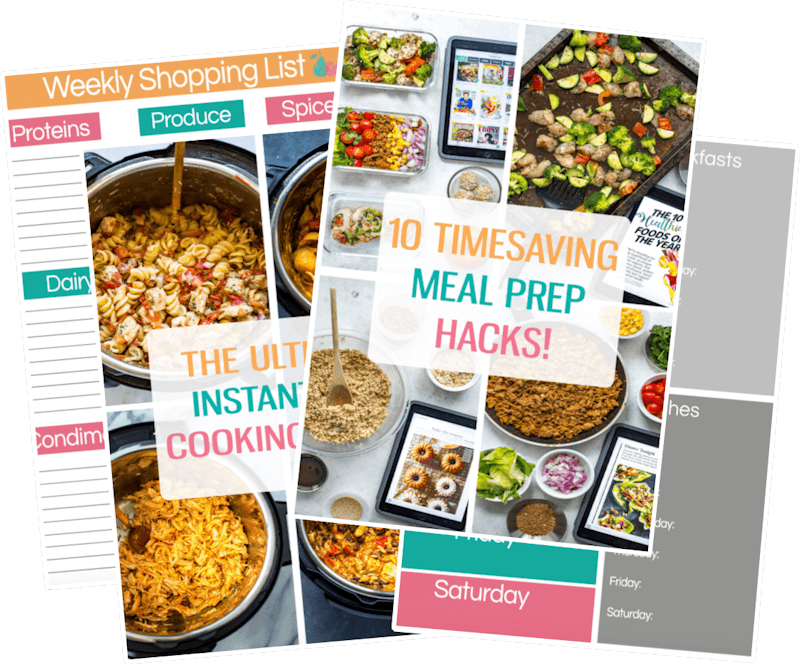 I have a couple vegetarian family members and love vegan food so I’m always trying to find alternatives to make certain recipes. I mean squash is so delicious as is I probably shouldn’t have even added any milk in the first place hahaha. And tell me about it. I’ve been trying to stop work at 5pm every day and feel like I will have to – your body’s natural rhythm can’t fight the dark! This recipe sounds like a dream! 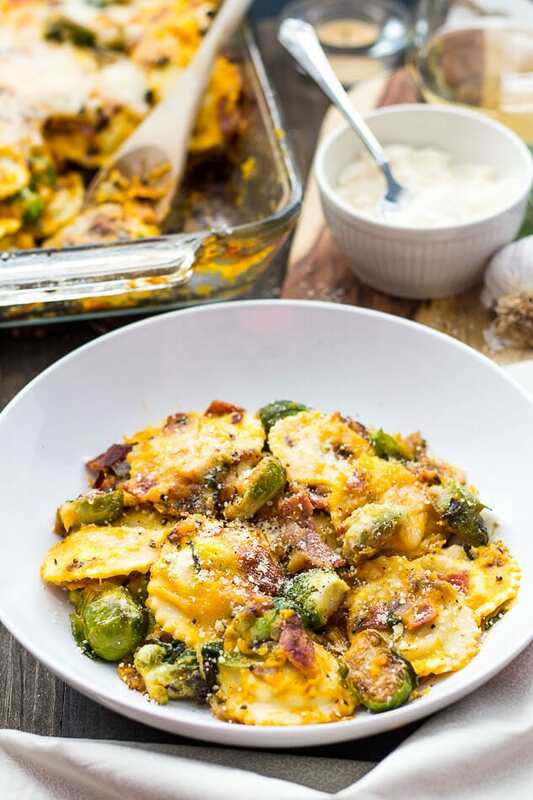 I love butternut squash sauce and love that there are brussel sprouts in this recipe. Yum! This dish looks pretty yummy. I don’t have an aversion to brussels sprouts and would happy to have a plate of this right now. 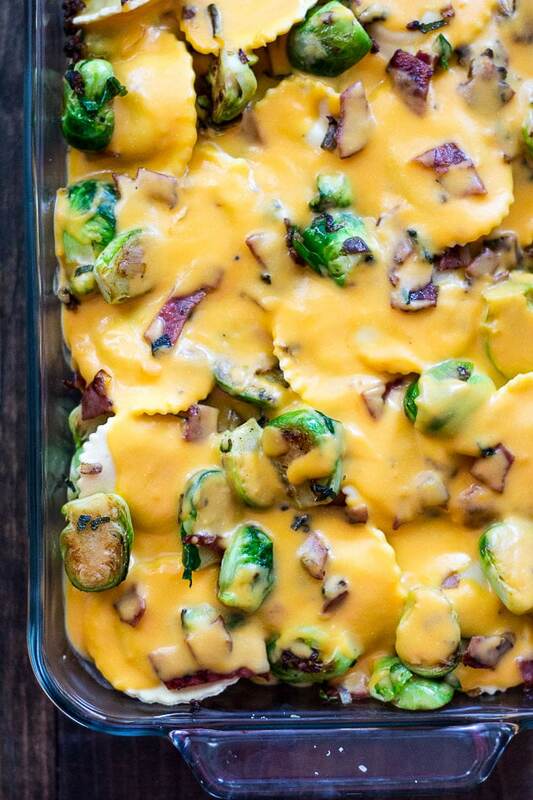 The perfect comfort food for fall…I love it! And I have several butternut squashes in the pantry right now! Thank you so much Evi! Such a good time to enjoy squash. We call it pumpkin where we come from and it is a very popular vegetable. I love it in ravioli. Nice job. Yes, yes yes! 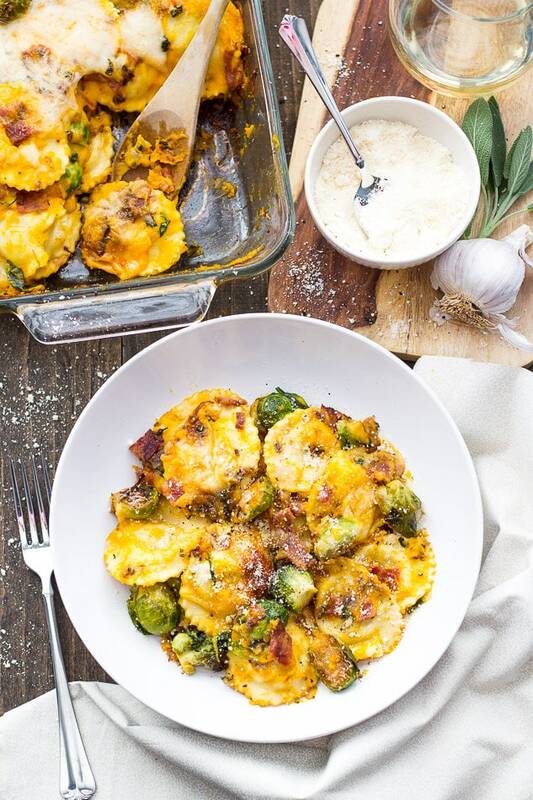 Way to take butternut squash ravioli (already delicious!) and make it 80425 times better. Not only is this gorgeous, but I can tell it’s packed with flavor, too! I recently started eating butternut squash – not sure what took me so long. This ravioli looks wonderful! Yum! Thank you Kristyn 🙂 Butternut squash is seriously one of my faves! I’m always looking for yummy ways to sneak sprouts into my meals. This sounds delicious! This looks amazing! How many ounces of raviolis did your two packages equal? Thanks!